WWI Family reunions have not been our thing. But recently we had a version of that to honour our grandfather (Mum’s father) who fought in various battles along the Western Front of the First World War. He served in Ypres, the Somme (over a million killed or wounded), the Scarpe valleys, Le Transloy, and finally at La Bassée where he had both legs blown off by a howitzer shell, and survived. Service sounds an odd word to use in regard to the folly of war. Yet that is what it was. My great-grandfather had disappeared – walked out of the family home in Kinsale County Cork and was never cited again – so life had not been easy for my great-grandmother and her children. Yet when it was time for her son, my grandfather, to leave home she wrote: ‘though this is the last thing I would choose for you, you must go and do what is necessary’. A few years later having been severely injured my grandfather wrote to his then fiancée, my grandmother, informing her that he was returning to England. The last words of his letter were: ‘I gave it my utmost’. 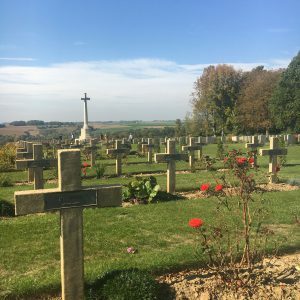 Gathered in what is now beautiful fertile farmlands of France and Belgium, we the next generations recently visited the trench lines where my grandfather served and the various memorials, which now punctuate the magnificent landscapes. I didn’t try and make sense of the war. Surely, that would just add folly to folly. But I did find myself silently pondering the ‘epithets’ of our great-grandmother/great-great-grandmother and grandfather/great-grandfather: ‘go, and do what is necessary’ and ‘I gave it my utmost’. To the Christian, there is a kind of eerie familiarity with that call and response. What might that mean for today? My siblings and first cousins do our own bit in various ways. But I drew particular hope from the way two young cousins are living those epithets or maxims today. One lives in Kenya and is married to a black Kenyan. In his early 20s he, Edmund, founded the Xavier Project (www.xavierproject.com) which has grown into a substantial provider of schooling and tertiary education for refugees along the Kenyan Uganda and Congo borders. And another, Paddy, works in Refugee Law, has learned Arabic fluently, and currently lives in Lebanon readying himself to be a builder of peace in Syria once the monstrous Assad and Putin and co have completed their war of power and annihilation. War has never been a solution to anything. But its memory can be a catalyst to the lasting glory of peace. The lives of Edmund and Paddy don’t make sense of war but they do provide a response of hope. At our family Mass (another first) at the conclusion of our time together I think we all left, in differing ways, renewed in resolve to live the fundamental Christian truth that life conquers death, and that love triumphs over evil. When that faith knowledge takes hold of our hearts, the adventure of Christian discipleship cannot help but captivate us.